The San Jose Blog: Dr. Martin Luther King Jr. Library - 10th Anniversary! Dr. Martin Luther King Jr. Library - 10th Anniversary! 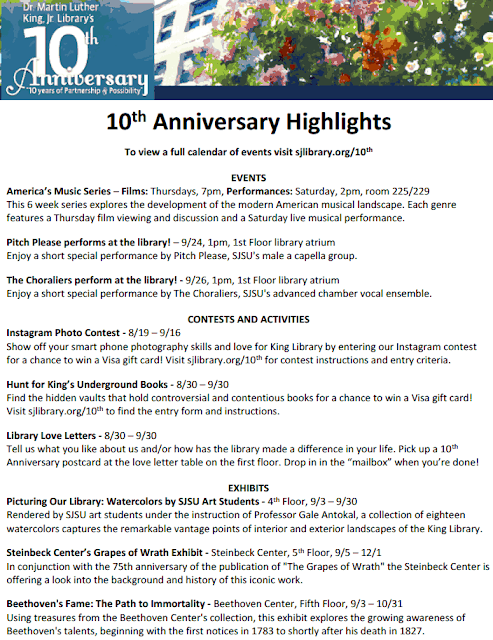 This month, the Dr. MLK Jr. Library is celebrating its 10-year anniversary with several events. These includes film viewings, live music, contests, activities, a neat art project, and special exhibits. You can access the full list of events at the Dr. Martin Luther King Jr. Library website over here. Thanks Mallory for sending this in.